The Billion Baht handshake: (l-r) Sukanya and Winston Gale, owners of The Riviera Group, with Siam Commercial Bank’s Executive Vice President Thanawatn Kittisuwan and Executive Vice President Multi-Corporate Parnu Chotiprasidhi. 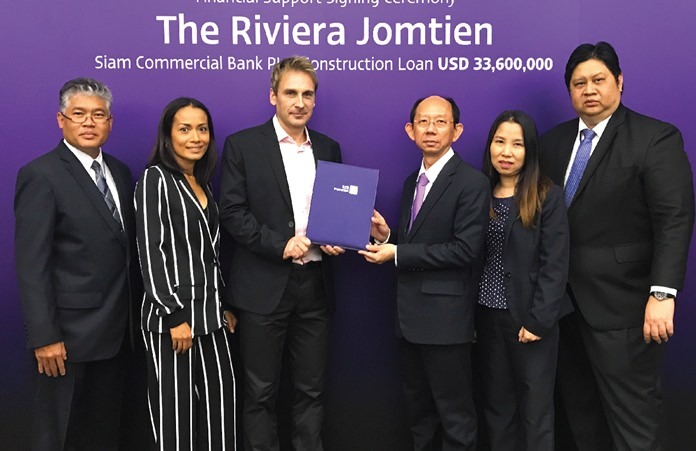 The Riviera Group, one of Pattaya’s leading Property Developers recently signed a Construction Loan Agreement of 1,050,000,000 baht with Siam Commercial Bank. The high-profile 46 story 68,000sqm High-Rise project located on Jomtien’s new 2nd Road has been long viewed in the industry as a significant and important project with predictions of landmark status when complete by end of this year. It will be Pattaya’s largest by single building scale alone: 1053 separate condominiums supported by 25 commercial units, with over 80% of the residential units enjoying direct sea views. The direct road makes the project just 2 minutes’ walk to the beach. In addition, the condo is fully equipped with high class facilities, such as a large pool and decking areas on the 37th floor, and the fabulous infinity edge sky pool on the 42nd floor providing a dramatic 360 degree panoramic view over the entire Jomtien Beach area, Koh Larn and Pattaya City. 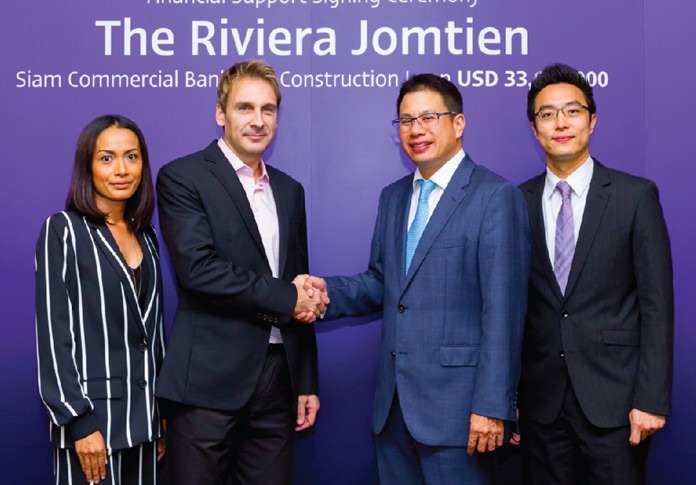 The Riviera Jomtien will boast both cutting edge architecture and 5 Star hotel-design qualities, now demonstrated in their Multi-Award Winning Flag Ship project The Riviera Wongamat, which was completed last summer. The working team that did all the hard work to make this historic event happen: (l-r) SCB Chonburi Regional Manager Anol Eaksil, Sukanya and Winston Gale, Project Director Sommai Ungrithong, Relationship Manager Suparp Kuhapensaengm, and Siam Commercial Bank Senior Vice President Credit Product Sontichai Sinchaipanid.